WOW, another week, gone! They really seem to just fly by lately! We are full blown into summer around here. This past Friday it reached 90. We had some rain and clouds this weekend, but today has been gorgeous! 75 sunny and not a cloud in the sky. We had an awesome weekend. I was able to get the rest of my flowers planted in pots, the yard is really coming along this year. A wine event which we hosted Saturday night, which was a ton of fun. Great people, great food and great wines. It started raining while we were all outside on the deck, but luckily we have this great awning and it covers half of the deck so we were all able to stay outside, such a bonus. Sunday we volunteered in the morning at Grillfest in downtown Minneapolis, and then were able to enjoy the event the rest of the day. 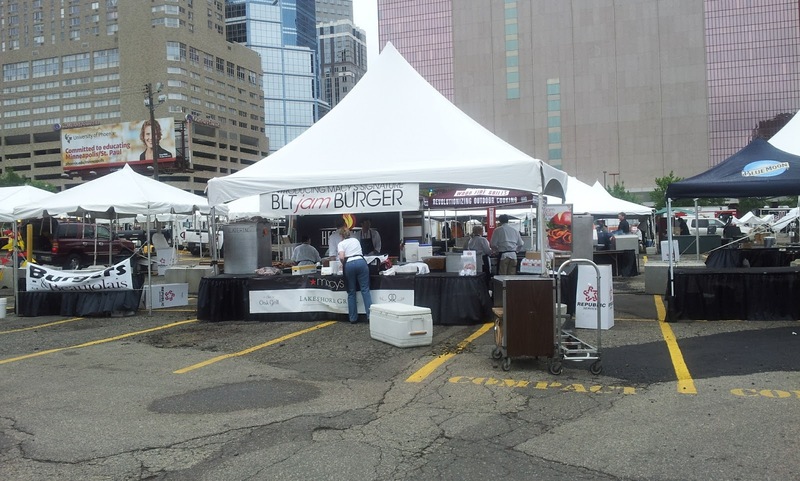 They had great food, wonderful drinks and fun grilling demonstrations. I learned a lot about different types of grills and smokers as well. We have a busy but fun week ahead, and then of course a three day weekend to look forward to. Plans - Home, long walk in the neighborhood - SO nice out! Dinner - Our local grocery store while out running errands. They have a great selection of salads, soups and hot food. I had a grilled cheese with pesto, tomato and fresh basil and tomato soup. The boy had fried chicken, potatoes and carrots. Quick and easy since we were out and about. Plans - Work on the landscaping, specifically the hill in the front of the yard, pictures to follow. BBQ in the evening at my sisters. Plans - Work on the house, organize closets and maybe the pantry. Dinner - Dinner party at our friend J's with T & J and sister J (can't wait to see her!). J & Sister J just got back from Rome, so it will be an Italian theme, and I am tasked with dessert so I am thinking about bringing chocolate truffles, blackberries, raspberries and strawberries.